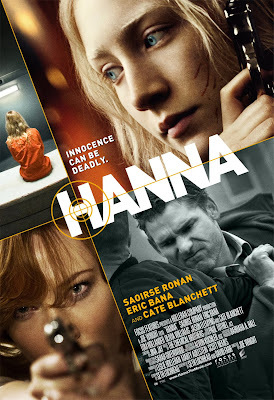 Continue reading after the jump to access my original review of "Hanna." I hate it when people try to describe a film critically by using the word “weird,” as though differing from one’s set perception of normality is somehow an inherently bad thing. Lots of wonderful movies can be described as “weird” – thinking outside the box often makes for terrific entertainment. In my mind, the word can only be used a legitimate criticism in cases where the film is so baffling that making sense of it as a cinematic entity is nearly impossible. Current worst film of 2011 Sucker Punch is a perfect example of a film that earns the “weird” stamp. Joe Wright’s Hanna, while by no means that bad, is another film undone by its own desire to be ‘edgy’ or ‘complex.’ In the end, it’s more or less incoherent, and few films have ever left me so completely unfulfilled when the credits rolled. Hanna is a 16-year-old girl who lives in a snowy forest with her father Eric, who has been teaching Hanna to be an expert assassin from a young age. She’s powerful, possesses innate defensive instincts, is fluent in many languages, and has been taught a number of elaborate backstories and personal histories in case she’s ever caught by the wrong people. Eric is trying to protect his daughter from a corrupt CIA agent, Marissa Wiegler, who seems to want Hanna and her father dead at all costs. One day, Eric allows Hanna to leave the nest, and she embarks on a journey to….well….kill people and ride in a van. At least, that’s what I got out of her story. It’s hard to know where to begin with the film’s laundry list of problems, but the biggest flaws definitely lie in the character department. The film tells its story fairly well with a decent pace, but it all falls apart once one looks at the characters, none of whom have sufficient motivation to really move the story along. Over the course of the narrative, we learn that Hanna was the product of genetic testing, created in a lab to be the perfect soldier. Eric isn’t her father, but he spearheaded the program, and it was rogue agent Wiegler who shut the program down, killed all the genetically manufactured children and their mothers. She next tried killing Hanna, but only managed to take out her mother, leaving Eric to raise the girl for her inevitable confrontation with Wiegler. Here are questions the film doesn’t ever bother answering about this scenario: Why was Wiegler allowed to murder so many people without getting arrested, and then remain a high-ranking CIA agent? What did she have against the program in the first place? Why did her vendetta continue for sixteen years? In short, what motivation does she have to do anything she does in the movie? As for Eric, what was his intention in creating and defending this program? Why did he feel so responsible for Hanna? Why did he raise her in the woods? When Wiegler went gunning for innocent children sixteen years ago, why didn’t he contact authorities and have her arrested? What was his ultimate goal in any of this? Eric and Wiegler are the epitome of underdeveloped characters, yet they are the main forces behind the story. Eric Bana, who appropriately enough plays Eric, makes his character somewhat interesting and covers up for some of these logical faults, but Cate Blanchett is so utterly directionless as Wiegler, doing nothing but putting on a hammy accent and chewing the scenery, that her character completely derails the movie. Hanna herself isn’t exempt from lack of motivation, despite a wonderful performance by Saoirse Ronan. The film is extremely minimalist in its characterization, but as far as I can tell, the opening scenes establish her desire to see and discover the outside world. It makes sense, therefore, that the film spends plenty of time letting her do just this. The problem is that both the character and the film completely fail to capitalize on this opportunity. There is one terrific scene where Hanna discovers electricity and becomes overwhelmed with fright, but otherwise, her motivations are unclear. She travels with and befriends the world’s most annoying family, seemingly out of a desire to “belong,” but this totally contradicts how much Hanna naturally and instinctually mistrusts people. It’s what Eric taught her, yet she forgets it as soon as she got out on the road. For that matter, if Eric was training Hanna to fend for herself in the world, why didn’t he teach her about computers or electricity or technology or driving or….never mind. If I keep picking apart all the inconsistencies, we’ll be here until next week. The narrative never seems to move anywhere when, by the time the credits roll, we continually fail to understand why the characters do the things they do. It’s especially disappointing given how the rich backstory provides ample opportunity for good character-based drama. This potential is entirely squandered, however, and this is what makes the movie feel so strange. It walks, talks, and acts like an action-thriller, but the characters are gutted, moving about the playing field without any clear motivation. It’s just strange, and when the movie ends without answering any of the dozens of questions it raises, it becomes even worse. The film simply feels weird. There are things to like, however. Joe Wright’s direction and Alvin Kulcher’s cinematography are top-notch. The action sequences are creative and thrilling, even if they do come out of a generally incoherent narrative, and the camera moves in truly astonishing and invigorating ways – there’s an incredibly long and complex single-take shot culminating in a tremendous fight sequence that is nothing short of a miracle, and serves as the highlight of the film. The sound design, including a tremendous musical score by The Chemical Brothers, is consistently awe-inspiring, and if your theatre has a good speaker system, the sound is penetrating and enveloping on a level I’ve rarely experienced. In the end, though, Hanna is a classic example of style over substance. It looks and sounds great and often provides some visceral thrills, but any further inspection leaves the viewer baffled. Yet the film invites examination with many ‘artistic’ touches that beg interpretation. All I was left with were questions, questions that made the entire experience seem hollow, pointless, and somewhat insulting. Hanna is weird, unlike any movie I’ve ever seen, but it never does justify its incomprehensible existence.